I've recently become even more obsessed with glass containers and jars. I can't help it. They're all just so nice...and glass like...and chic...and...just awesome to have around the house. I have some I use as vases, some I stuff twinkle lights in, to add nice soft lighting to our living room...Some larger ones I use as drink containers for homemade iced tea or lemonade...there's a million things to do with glass jars. 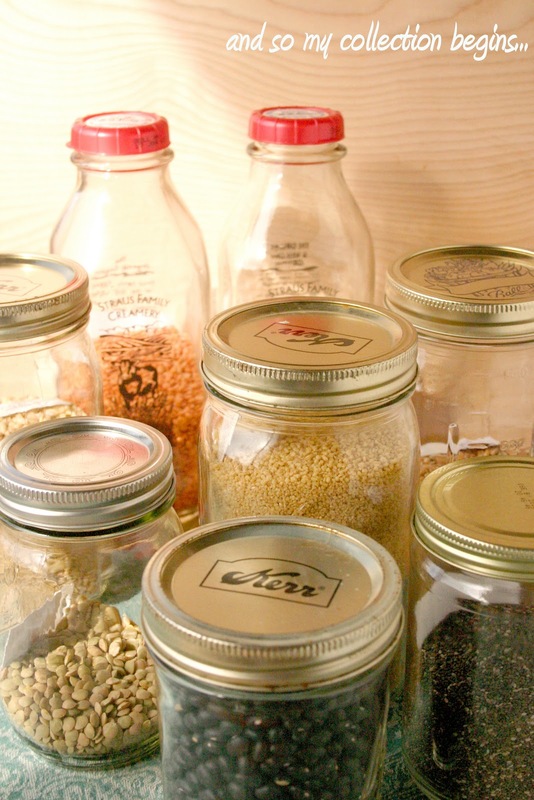 More recently, I've really taken to buying dry goods in bulk at our local health food store and using said glass jars as storage containers. It makes my cabinet look neat and tidy-which in turn makes for a very happy Christina. I like things that are "neat" and especially "tidy". I couldn't be happier. I plan on getting a lot more dry goods as the weeks go on- and sort of have a can-free cupboard soon. Oh by the way, have you read this? Scary stuff. Anyway, it's grey this morning. We have the most fickle weather here. Yesterday...well and the day before that, it was 80...today, cold and grey. Oh and it was freezing this past weekend with off and on rain. Definitely fickle. Definitely hard for those who get sick easily. Thank goodness my husband and I are not part of that club. Yesterday I had some Etsy orders I had to finish up- and I was sweating my face off while doing so- at 4pm! Our house somehow had turned into a little fiery furnace of sunshine, heat, sweaty people (and cats). Poor cats. I couldn't imagine walking around with a fur coat (although beautiful) stuck to me...And Mombi- she's so...chubby! All that extra cat weight...plus hair...on a hot day...Ugh. Needless to say the last two night's dinners were hardly anything to brag about. Wednesday night I came home from a day out and couldn't get my pants and shirt off fast enough, it was so hot. I quickly changed into some "house only" appropriate clothes before I even had a chance to say "hey" to my hubbie. That night we had ceviche. There was NO way a hot oven or flame was entering our living spaces. Last night wasn't as hot, so I did engage in flame cooking. But it had to be a quick one because I could only stand the kitchen heat for so long. So we had fried eggs on toasted homemade bread, with sauteed beet greens (with garlic) and Parmesan. Simple, nourishing, and totally a "hot night" kind of quick meal. But the night before that...that's the meal I want to share with you all. Wanting to really utilize my new dry goods, I remembered I had pinned a recipe a long time ago for a recipe Whole Foods had. In it, they included things I had just bought and was antsy to use as soon as possible. Not only that, but I had also been trying to find/create a new veggie-burger type thing because the store bought one we've been munching on lately was no longer liked by my sweet husband. It was also store-bought...'nuff said. Lentils- In a small saucepot add your half cup of rinsed lentils and 1 cup of cold water (make sure to pick through lentils and discard any bad ones or stones). Cover and bring to a boil. Turn down heat till you have a simmer and simmer for 15-20 minutes, or until lentils are cooked through but not mushy. Drain any remaining liquid. Quinoa- In a small saucepan add 1 cup water (or stock)- bring to a boil. Add your quinoa and stir. Cover and simmer for 15 minutes or until quinoa is cooked all the way. If there is any liquid remaining, drain it off for this recipe. 2. Boil cubed sweet potatoes until fork tender. Drain well and puree using either a blender, food processor or your potato masher! Set aside. 3. Grate your onion into a large bowl, drain any liquid that accumulates. Finely chop your red bell pepper and add to your onion. 4. Add your cooked lentils and quinoa to the red pepper/onion and mix well. 5. Add the paprika, oregano, cumin, chia seeds, salt, and pepper. Mix well. 6. Next add your sweet potato puree and mix gently to combine. Combine thoroughly. This is what your mix should look like after everything is incorporated. 7. Spray a sheet pan lightly with oil and make 4 generous portioned patties (or 5 smaller ones). Place on top of the sheet pan (or place on a plate and wrap with foil if wanting to cook later on). 8. Bake at 375*F for 15-20 minutes. Flip very carefully and bake 10 minutes more. **Alternatively, you can very lightly and gently saute these in a pan...or if you're SUPER careful grill them. 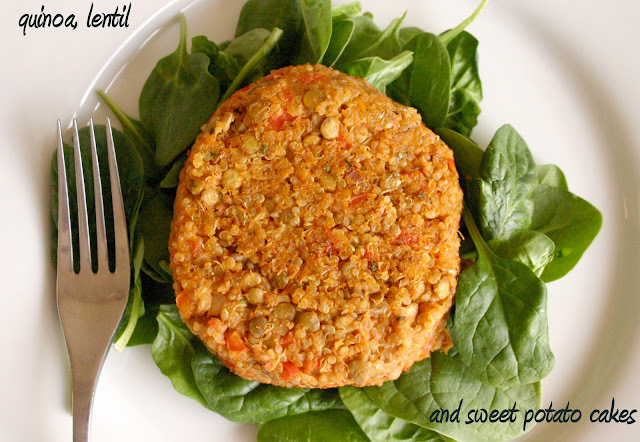 Although these would make excellent veggie burgers (which we will be doing) we decided to lighten up our dinner even more and just serve over a bed of organic baby spinach. As Rachel Ray would say, "Yum-O." Yes, me too with jars! Love this trend. The cakes look fantastic!